Before running a report from Report Painter, you can quickly switch the output format in which it will appear. The Report Options dialog box is driven by the selected output format. This enables you to easily distinguish between various options specific to each output format. Formats are grouped into the following categories: Styled report formats, Unstyled formats, and Database formats. If you are opening a report that was created using the Document Composer tool, the output format cannot be changed. The Styled report formats are shown in the following image. The Unstyled formats are shown in the following image. 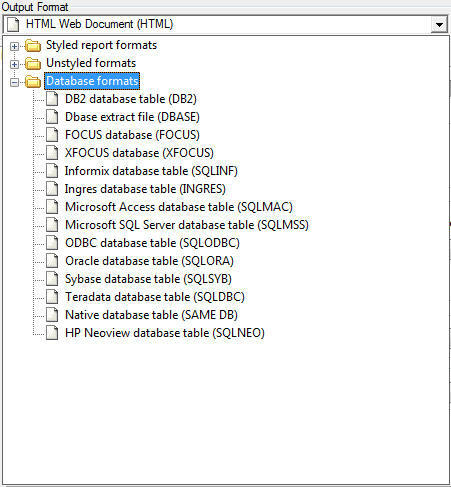 The Database formats are shown in the following image. The Report Options Output tab, Features tab, and Format tab are available to set different styling attributes. The Style, Drill Down, Computes, View, and Images tabs are also available. The Output, Computes, and View tabs are available for all formats. The Features tab is available for HTML, PDF, Default, and User report formats. The Format tab is available for all Styled report formats, except Excel 97. The Style tab is available for all Styled report formats. The Drill Down tab is available for all Styled report formats, except PostScript and Excel 2000 PivotTable. The Images tab is available for the HTML, PostScript, and PDF styled report formats. The Features, Format, Style, Drill Down, and Images tabs are not available for formats in the Unstyled and Database categories. A Delimiter is needed for the DFIX format. The format you choose in Report Painter applies only to the current execution of the report. If you wish to change the default display format for all subsequent reports created in Report Painter, click Options from the Windows menu, and specify a report format from the Reporting tab. In Report Painter, click Output from the Report menu. The Report Options dialog box opens. From the Select Format drop-down list, choose the output format for the report. Click the drop-down list on the Output Format toolbar. Choose an output format for the report. Tip: If you wish to change the default display format beyond a single report execution, select Options from the Windows menu in the Explorer, and choose a different report format from the Reporting tab. From the Select Format drop-down list, click User as the selected output format for the report. The Edit User Format button appears. Note: You may also select multiple style sheet blocks when User is selected as the output format. The active style block (HTML, EXCEL, PDF, AHTML, FLEX, APDF, PPT) present a subtab on the Report Options dialog box with corresponding report options available for that style block. For more information about selecting style blocks, see Generating Format-Specific Style Blocks. Click the Edit User Format button. The Variable Editor opens, which enables you to assign a variable as the display value and select the output format of a report, as shown in the following image. The Accept List shows a list of available report output formats to choose from. You can add or delete display values. When you run the report, the WebFOCUS Auto Prompting Facility screen opens instructing you to select a parameter. Select a display output and run the report. You may set different styling formats for your report by using the Features tab on the Report Options dialog box. The Features tab contains different options depending on the selected output format. Enable On Demand paging, a feature that speeds the delivery of HTML output to your browser. For details, see How to Request On Demand Paging for an HTML Report. Control the positioning of the redesigned OLAP Control Panel or request the original version of the OCP. For more information, see How to Control the Display of the OLAP Control Panel and OLAP Selection Panel. For details, see Analyzing Data in an OLAP Report in the Online Analytical Processing (OLAP) manual. Enable Automatic Drill Down in OLAP-enabled reports. Auto Drill Down enables you to automatically link to the next lower level in a defined Dimension hierarchy or Measures list by clicking a related data value in the body of the OLAP-enabled report while the OLAP Control Panel is closed. For more information, see How to Enable Auto Drill Down. For details, see Analyzing Data in an OLAP Report in the Online Analytical Processing (OLAP) manual. Identify an external Cascading Style Sheet (CSS) or use an internal Cascading Style Sheet to take advantage of improvements in the display of HTML reports in browsers. For details about external CSS, see How to Apply an External Cascading Style Sheet to an HTML Report and the Creating Reports With WebFOCUS Language manual. For information about internal CSS, see How to Apply an Internal Cascading Style Sheet to an HTML Report. Type a name for an HTML report in the Report Title input field. It appears in the browsers title bar. Use Accordion Reports. For more information, see Controlling the Display of Sorted Data With Accordion Reports. Freeze the scrollable area and display a scroll bar for HTML output. 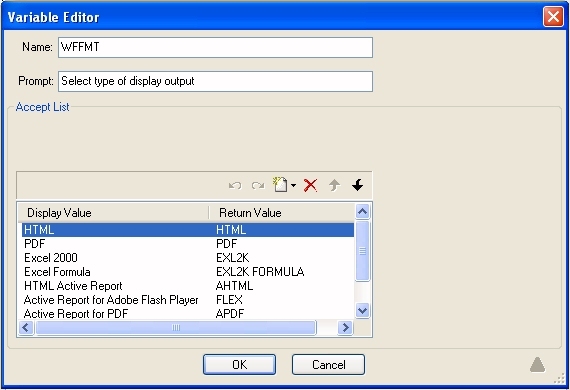 For more information, see How to Freeze the Scrollable Area for HTML Report Output. This option causes the server to send the report to your browser one page at a time. You can use controls on your browser to display the next or previous page, all pages, or to navigate to a specific page. This procedure assumes that the required setup has been done to enable On Demand Paging and that your procedures are being run remotely against a WebFOCUS Reporting Server. For details about on demand paging, see Navigating With On-Demand Paging in the Creating Reporting Applications With Developer Studio manual. Click Features from the Report menu. Ensure that HTML Web Document or HTML Table is selected as the output format. Select the On Demand Paging check box in the HTML options area. Select the Cascading Style Sheets check box in the Features tab of the HTML Option. Note: Cascading Style Sheets is selected by default. Cascading style sheets (CSS) are an extension to HTML that enable you to specify formatting for an HTML document. To link a CSS file to a report, use the External Cascading Style Sheet URL field in the Report Painter StyleSheet File Selector. Note: The external CSS (Cascading Style Sheet) file should be saved in an alias on the web server. Click the Style File Selection button. The StyleSheet Selection dialog box opens. Enter a URL in the External Cascading StyleSheet URL input field. Click Finish to close the StyleSheet Selection dialog box. For more information about the StyleSheet File Selector, see Using the StyleSheet File Selector. Disabled. OLAP options are disabled and not shown in the OLAP report. Off. Turns off the OLAP Control Panel and the OLAP Selections pane, but allows OLAP functionality from the report itself. You can access options on right-click menus, drag and drop columns within the report, and use up and down arrows to sort columns from high to low or vice versa. On. Provides access to the OLAP Selections pane from a square button to the left of the column titles. You can open the Control Panel by clicking the OLAP button in the OLAP report. Top Panel. Opens the OLAP Selections pane above the report. The Measures, Graph, and Dimension controls, as well as the band containing the OLAP, Run, and Reset buttons appear above the report output. You can open the Control Panel by clicking the OLAP button on the Selection pane. Bottom Panel. Opens the OLAP Selections pane below the report. The Measures, Graph, and Dimension controls, as well as the band containing the OLAP, Run, and Reset buttons appear below the report output. You can open the Control Panel by clicking the OLAP button on the Selection pane. Hidden Panel. Opens the OLAP report with the OLAP Selections pane hidden. You can perform a variety of analytic tasks from the report itself. Selection Criteria is shown next to the OLAP button. Show Tabbed. For OLAP reports that have multiple dimensions, this option groups the dimension elements under a tab labeled with the dimension name. Tip: You can also choose an OLAP options by selecting OLAP from the Report menu. Auto Drill enables you to transform a report immediately, by drilling down on Dimensions and Measures. Dimensions to enable automatic drill down functionality for dimensions. Dimensions and Measures to enable automatic drill down functionality for dimensions and measures. If you select an option from the Automatic Drill Down list without selecting an option from the Enable OLAP drop-down list, the Enable OLAP option will automatically be set to Off. This is due to Automatic Drill Down requiring an OLAP setting other than Disabled. If you attempt to change the Enable OLAP drop-down back to Disabled, you will receive the following message, as shown in the following image. Click the Build Auto Drill Dimensions button to invoke the Dimension Builder. For more information on the Dimension Builders, see the Describing Data With Graphical Tools manual. You may freeze page headings and footings, report headings and footings, column titles, and totals for your report output. A scroll bar is created so that the headings and footings are locked in place in the HTML output. The freeze option is available from the Features tab of the Report Options dialog box. Note: The Features tab is only available for the following report output formats: HTML Web Document (HTML), Portable Document Format (PDF), Default, and User (HTML) reports. In Report Painter, click Features from the Report menu. The Report Options dialog box opens at the Features tab. From the Freeze section, select the freeze type from the Headings/Footings drop-down list. Off. This is the default. On. Freezes the headings, footings, column titles, and totals. Top. Freezes the headings and column titles. Bottom. Freezes the totals and footings. Enter the scroll height in measurement of inches. Note: If the scroll height is not set, the default scroll height is 4 inches. In the example below, Freeze is set to ON. The page heading (Sales by Movie), report heading (Sales Report), and column titles (RATING, CATEGORY, TITLE, WHOLESALEPR) are frozen when scrolling in the browser.